If she wasn’t such an ice-cold-hearted person, one might almost feel sorry for Hillary Rodham Clinton. Now, before she even officially declares her candidacy for the Democratic Party nomination in 2016 to become successor to Barack Obama as President, she lands in the middle of another very ugly scandal. This new scandal might well spell the end of her presidential obsession, and that of her obsessive husband Bill Clinton to get back into the power loop. The new scandal involves Haiti, that tormented island in the Caribbean which gets hit not only by earthquakes but also by the ravages and looting acts of the Clintons and their friends and relatives. It involves obvious misuse of Bill Clinton’s position in Haiti since the January 2010 earthquake that killed more than 300,000 Haitians. It involves nepotism with the brother of Hillary Clinton. It involves Hillary directly, and it involves a foundation owned by the Clinton family which works closely with a reputed Mexican narco kingpin and some of the dirtiest Clinton political associates from their days in Washington. The timing of events here is important. On March 5, the popular web blog Breitbart published a story taken from an about-to-be-released new book by award-winning journalist, Peter Schweitzer titled, Clinton Cash: The Untold Story of How and Why Foreign Governments and Businesses Helped Make Bill and Hillary Rich. The book details facts around an unprecedented award for a gold mine, the first such granted in Haiti by the government in 50 years, to an obscure North Carolina company named VCS Mining to mine the Morne Bossa. VCS Mining according to Schweitzer, had on its board of directors Tony Rodham. Never heard of him? Hillary Clinton’s family name is Hillary Rodham and Tony is her brother. Not only that, but the mining company also lists another board member, former Haitian Prime Minister Jean-Max Bellerive. Bellerive co-chaired the “charitable” Interim Haiti Recovery Commission with former US President and Hillary’s husband (at least legally), William Jefferson Clinton. Moreover, the terms of the first new gold mining license granted by the Haiti government were made with no Congressional involvement and the state of Haiti got royally cheated. The terms of Rodham’s gold windfall upset members of Haiti’s senate: The government’s royalties under the deal were just 2.5 per cent, half the customary rate. And VCS mining has an option to renew the terms for 25 years. On March 6, one day after the March 5 story hit, VCS Mining on its scanty website (which reveals no single name of any officers or directors nor any annual report or financial report), published an “Immediate Press Release.” It denied that Rodham or Bellerive played any role in the highly suspicious and strange deal. Even more bizarre is that the press release is the only statement on the company’s entire website. Further search in the company directories of Bloomberg/BusinessWeek to find names of the current board turned up…..nothing. In a report on the company dated March 12, 2015, Bloomberg wrote, “There is no Other Board Members data available.” Did the company scrub their records to hinder further embarrassing scandals that would jeopardize Hillary’s presidential bid which, until two weeks ago when the State Department email scandal broke, looked like a done deal? It is looking more and more likely that the emails Secretary of State Hillary Rodham Clinton wrote in the years she was Secretary, which she refuses to turn over in full as required by law to the US Government, would contain explosive revelations about her role in Haiti after the earthquake. It has just been revealed that she used a private email address run on her own server, during her years at the State Department, and never had a ‘state.gov’ address as required for government official business. She ran all her professional emails through her own Internet domain, ‘clintonemails.com.’ When she left office her emails left with her. 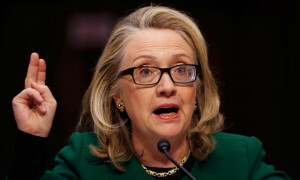 That included emails that would have dealt with her response to the Haiti earthquake. The Federal Records Act requires employees of executive branch agencies to keep all of their emails and make all of them available for permanent retention. The plot gets uglier. While she was doling out billions in US taxpayer dollars to unspecified projects in Haiti, husband Bill Clinton was serving as UN Special Envoy for Haitian earthquake relief as co-chair with Jean-May Bellerive of the Interim Haiti Recovery Commission. At the same time, Bill was head of the Clinton Foundation, which claimed to have raised $36 million from “private contributors” for Haiti relief. However, the Clinton Foundation, at the time Hillary was Secretary of State, also accepted money from countries that Hillary Clinton dealt with while Secretary, including the UAE, Qatar, Saudi Arabia and Iran, brazen conflicts of interest should Clinton become president. In one case the Clinton Foundation accepted a “gift” of $500,000 from the Algerian government to “benefit earthquake relief efforts in Haiti.” Hello? Then we have to look more closely into the Clinton Foundation and there we find interesting people chosen to be on their Board of Directors. Bruce Lindsey serves as the chairman of the Board for the Clinton Foundation. He has been described as Bill Clinton’s Consigliere, as in the mafia lawyer who cleans up messes in the family. Lindsey has been at Bill’s side since their days in Little Rock when Bill was governor and Hillary a lawyer with the Rose law firm. Lindsey was Clinton’s White House Counsel for all eight years. Now he is chair of the Clinton Foundation. During the Clinton presidency, Lindsey was accused by Republicans of soliciting Asian money for Democrats and for Clinton’s legal defense fund on the Monika Lewinsky-ted impeachment trial. Lindsey was present at White House meetings with shady Clinton fund-raising figures such as John Huang and James Riady. Republicans at the time also suspected Lindsey–who oversaw White House document-gathering in response to congressional subpoenas–was “cleansing” documents to keep information from the Congressional panels. Now we continue looking at today’s Clinton Foundation board of directors and lo and behold we find Ms Cheryl Mills. Never heard of her? She was Hillary’s Chief of Staff at the State Department and as it states in her bio, she “served as counselor and chief of staff at the US Department of State where she managed the foreign policy and operational priorities for the $55 billion agency.” Mills was Manager of foreign policy and operational priorities for Hillary Clinton? Did she also play a dirty role in the Haiti scandals with Bill Clinton’s Interim Haiti Recovery Commission when Hillary’s USAID was splashing billions of US taxpayer dollars into something or some ones in Haiti? We may never know because it comes out in the latest State Department “email-gate” scandal that not only Hillary refused to use official US Government internet email for state business. Fellow member of the board of directors of the Bill, Hillary & Chelsea Clinton Foundation, Cheryl Mills also used the private clintonemail.com email address for her government correspondence. Then another member of the exotic Clinton Foundation board is a mining and motion picture mogul, Frank Giustra. In 2007, Frank Giustra and Bill Clinton launched something called the Clinton Giustra Enterprise Partnership. Their stated purpose was to create “social and economic development programs in parts of the world where poverty is widespread, including Colombia, Peru, Mexico, and Haiti.” That morphed into the Clinton Giustra Sustainable Growth Initiative (CGSGI). The two men then brought in a third, a Mexican named Carlos Slim, who matched their initial $100 million fund. The three men apparently enjoyed working together so in 2010, just after the Haiti earthquake, with Clinton as Special UN Envoy to Haiti, they established another $20 million fund to finance small businesses in earthquake-ravaged Haiti. According to the annual Forbes list of the world’s richest people, Carlos Slim is probably the richest, just passing Bill Gates to be worth an estimated $81.6 billion. He owns Telmex, the largest telecom in Mexico and a network of banks and companies and airlines. He even bought himself blue-blood WASP respectability several years ago by rescuing the ailing New York Times for a mere $250 million. As well, Carlos Slim is in the Executive Committee of the Board of Trustees of the RAND Corporation, a major Pentagon contractor and leading neo-conservative think tank behind the US CIA strategies of Color Revolutions, “swarming” and such. That has interesting implications for US national security. According to Hopsicker, Fernando Chico Pardo, a top level business associate of Carlos Slim, left Slim’s employ with the latter’s blessing, to take over Grupo Aeroportuario del Sureste, S.A. de C.V., (ASUR), a publicly-traded corporation which Mexican sources say moves large quantities of cocaine through Cancun International Airport, which ASUR runs and manages. ASUR controls a dozen Mexican airports. Pardo, according to these reports, was Slim’s alter-ego and right-hand for 16 years. He still has a seat on the board of Carlos Slim’s holding company and Pardo’s brother, Jaime Chico Pardo, is President of Slim’s major holding, Mexican telecommunications giant Telmex. Mexican well-researched press reports claim that Fernando Chico Pardo’s Grupo Aeroportuario del Sureste, S.A. de C.V., (ASUR) is involved in the drug trafficking major leagues, and was reportedly complicit in the big “drug move” in September of 2007 which ended with an American Gulfstream jet carrying 4 tons of cocaine crashing in the Yucatan. Dantò adds that Bill Clinton made no attempt to conceal his Haiti aid corruption. Neither did US Secretary of State Hillary Clinton: “They pushed their own Haiti staff members into nominal positions of power to rubber stamp their edicts. Haiti Prime Minister Gary Conille, who succeeded Jean Max Bellerive, worked as chief of staff for Bill Clinton and as a UN development expert. “Cheryl Mills, another Clinton staffer named in the Clinton “email-gate” scandal and who today is on the board of the Clinton Foundation, also served as the United States’ representative on the Interim Haiti Recovery Commission (IHRC). It’s beginning to look like Hillary Rodham Clinton faces far more scrutiny for her dealings than she hoped for. But one thing is certain. The New York Times, formerly America’s most respected newspaper of record, will never tell us this about Hillary’s murky dealings in Haiti. Why? Look no further than Carlos Slim, that paper’s second largest stockowner and long-time business partner of Hillary’s foundation in Haiti. Bill Clinton’s involvement in some of the Haitian quake dealings actually made him to be liable as a Haitian citizen, under the law. Some people scrambled around when this was discovered to be true. The most dangerous woman in the entire planet.